Can You Substitute Asian Eggplant for Italian Eggplant? 4 Can You Substitute Asian Eggplant for Italian Eggplant? For those unfamiliar with eggplant, the vegetable may seem like an insurmountable task at first. With a thick, purple peel surrounding spongy light green flesh, the eggplant is actually quite easy to master. Becoming familiar with the versatile vegetable opens up a world of great dishes that are comforting, healthful, and delicious. Eggplant is a good source of antioxidants, fiber and potassium. While it contains vitamins B1, B3, B6, and copper, manganese, the density of the vitamins and minerals is low in comparison to some other vegetables. This low-calorie food makes for easy eating as well as easy cooking. There are many types of eggplant, but Black Beauties, Black Bells, and Black Magic are the most commonly used. They are large, pear-shaped, and have deep purple skin. Other eggplant varieties include Sicilian, Italian, Japanese, Chinese, White, and Indian. 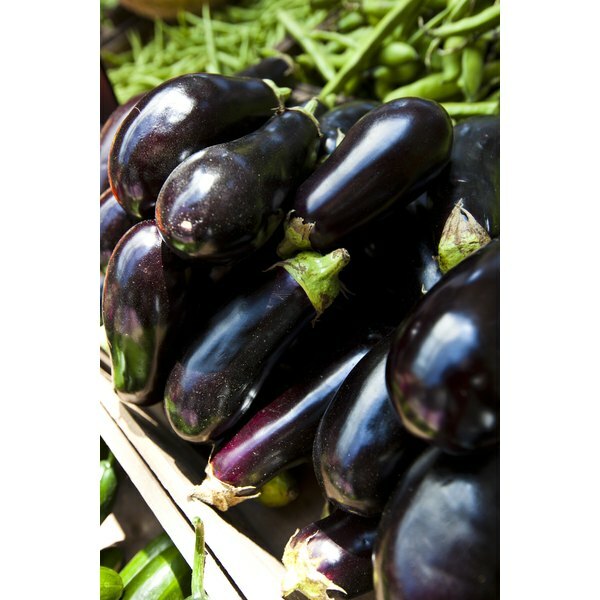 Eggplants are in season August through October, but are available at most grocery stores year-round. When purchasing eggplants, select those that are firm with taut, smooth, shiny peels. As eggplants age, their peel becomes wrinkled and slightly discolored. Unlike other hearty vegetables, eggplants go bad quickly. Store them in a plastic bag in the refrigerator and use them within 3 days of purchase. Here are 9 ways you can incorporate eggplant into your cooking, starting with this comforting Baked Eggplant Penne Pasta dish from Diethood. Not only does this flavorful and easy recipe show you how to make stuffed eggplant, but it gives you a taste of baby eggplant. Try these Roasted Baby Eggplants with Goat Cheese Stuffing from Running to the Kitchen. Grilling eggplant adds smoky flavor to the vegetable and it requires only a few minutes of time. This Greek Marinated Grilled Eggplant from The Lemon Bowl uses the Italian variety of eggplant and demonstrates how to marinate and grill eggplant. One of the most popular eggplant recipes is ratatouille, which involves braising eggplant, squash, onions, and peppers with tomatoes. This classic ratatouille from Cupcakes and Kale Chips is always a family favorite. Nothing beats a crispy appetizer with a flavorful dipping sauce. Frying eggplant makes it very soft and tender and lends a great deal of flavor to the otherwise subtle-tasting vegetable. Plus, everything is better fried! This Grain-Free Thai Eggplant Tempura with Spicy Garlic-Soy Dipping Sauce from An Edible Mosaic is an excellent example. Roasting eggplant is one of the more common methods for preparing the vegetable. They are often roasted before pureeing for soups or spreads. Try these Roasted Eggplant Kale Pesto Sandwiches from The Roasted Root for a tasty vegetarian lunch. Once cooked, eggplant can be used in a wide range of dishes, including salads. Simply tossing together fresh seasonal ingredients in a homemade vinaigrette is a sure way to enjoy a healthful and flavorful side dish. This Roasted Eggplant and Tomato Salad from A Healthy Life For me is the perfect example. Baba ganoush is a popular spread served in the Middle East. Similar to hummus, it is pureed with garlic, tahini, and lemon juice. Make this Smokey Baba Ganoush from The View From Great Island and serve as an appetizer or use it as a condiment on sandwiches. Many vegetarians use eggplant as the go-to for replacing meat to achieve a hearty and satisfying meal. Eggplant parmesan (or parmigiana) is a classic dish employing the baking method of preparation. This simple and straight-forward Eggplant Parmigiana recipe from In Good Taste will get you hooked! Julia Mueller is a food blogger at TheRoastedRoot.net. She is the author of two cookbooks: "Delicious Probiotic Drinks" and "Let Them Eat Kale!" When Mueller is not developing recipes or snapping food photos, she enjoys hiking and mountain biking. Can You Use an Eggplant if It Has Rotten Spots?